Get away from it all and discover the freedom of wild Sussex glamping with a visit to The Secret Campsite Wild Boar Wood. Set in a private five-acre woodland near Haywards Heath in West Sussex, our small off-grid campsite offers a fantastic option for those looking to experience glamping near London, Brighton and the South Coast. The campsite has just nine bell tents tucked away among the trees and opens from April to October. Here, you can enjoy the simpler things in life as you relax around the campfire, enjoy the natural surroundings and make a hobby of waving at steam trains passing on the Bluebell Railway. For those looking for tent pitches and more more of our ‘wild Sussex glamping’ bell tents please visit one of our East Sussex campsites – The Secret Campsite Beech Estate or The Secret Campsite Lewes. Our British made five-metre bell tents offer an easy way to camp in the woodland as tents are set up ready for your arrival. Each is equipped with a double bed with a memory foam topped mattress on a wooden base, additional fold-out mattresses, cooking equipment and tableware. Outside you have your own fire pit area, grill, eco stove and picnic table. We even provide a bag of firewood for each night of your stay. But we do like to keep things simple, we have no hair dryers or phone chargers and our on-site wardens can’t provide a butler service. 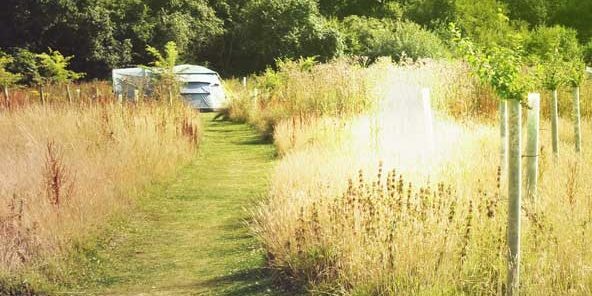 Cars are parked away from the main camping area so you have a little walk to our lovely woodland before you find your tent tucked among the trees. We aim to provide somewhere you can appreciate the birdsong and bluebells that make Wild Boar Wood such a special place. We have two faraway bell tents which offer a little extra seclusion. There are also some tents which are perfectly placed for families or small groups to camp together. The West Sussex glamping site is ideal for a group of families wishing to stay together. We have designed the campsite layout and placed some of the bell tents to allow for smaller groups to be able to share a fire and be located alongside each other. For families this ensures that if the parents stay up later chatting around the campfire, they can hear their children if they should wake up. Full campsite bookings are available too and mean that families or groups can book all nine bell tents for exclusive use of the woodland, the tents and the facilities. Groups are able to gather together in the central area where there is a larger fire pit area. The exclusive hire option is perfect for larger groups, corporate retreats and family gatherings looking for a peaceful break – well placed so you can go glamping with London within a convenient distance. 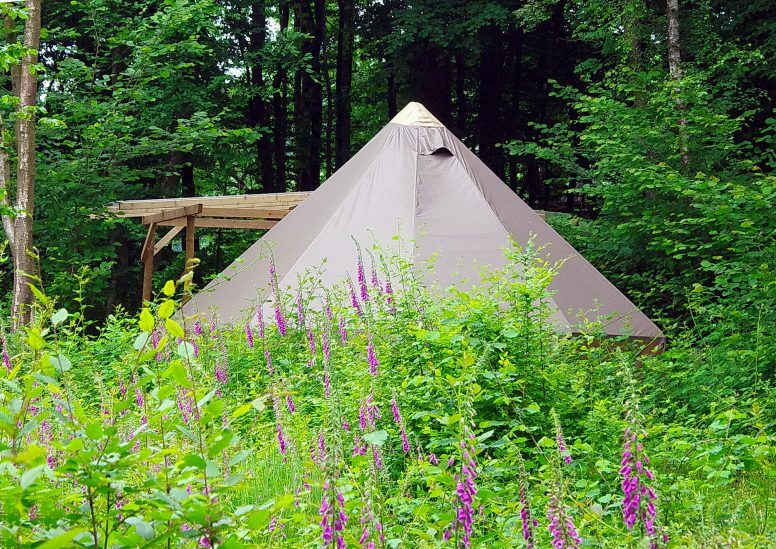 We are all about providing a group glamping space that focuses on nature, peace and space. We ask all campers to be conscious of and respect their neighbours (both other campers and people who live in the area). 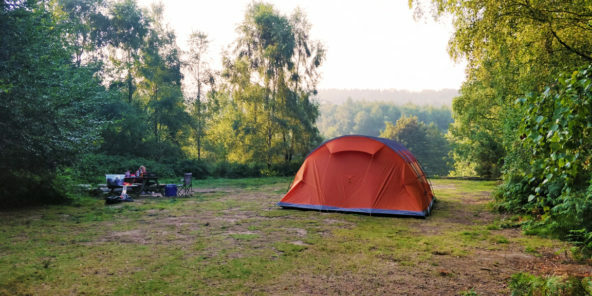 For this reason we have a low noise policy before 9am and after 10pm – so children (or adults) shouting or screaming on the campsite either side of these times is not allowed. We also have a strictly no amplified music policy onsite. If you are a group and after a ‘rave’ in the woods please look elsewhere. Please note this campsite is off grid – we have no mobile phone charging points or electricity. There’s no electricity and no amplified music allowed on site so you can switch off and enjoy the surroundings. Cars are parked in the car park and are not able to access the main areas of the campsite. We provide ecological washing up liquid, hand wash and body wash.
We have mains water taps. Sorry no dogs or pets are allowed onsite due to local authority conditions. For bookings of more than four adults or eight campers in total or if you want two or more families in adjacent bell tents, please contact the office so we can advise on availability. All groups please contact the office prior to booking to ensure we can find the best combination to have you stay close together. Weekends (Saturday night bookings) require at least a two-night stay. Bank holidays (bookings for a bank holiday weekend) require at least a three-night stay. If you need to know more details about our Easy Sussex glamping option, check out our Frequently Asked Questions page or please feel free to get in touch with the office. We try to minimise our impact on the environment and provide an experience based on the freedom of wild camping with the basics taken care of. We hope to have you visit our lovely woodland for some Sussex glamping near London, Brighton and the South Coast.